Franz Tunder (1614‐1667): another of those superbly schooled North German musicians whose name was quickly eclipsed by the great Johann Sebastian, but whose music has happily been rediscovered by the historically informed performance movement. Indeed he studied with Frescobaldi, the forebear to whom Bach himself owed much, and the Florentine influence is apparent in some of the stile antico harmony of the chorales and the dancing rhythms of the Canzona in G major. 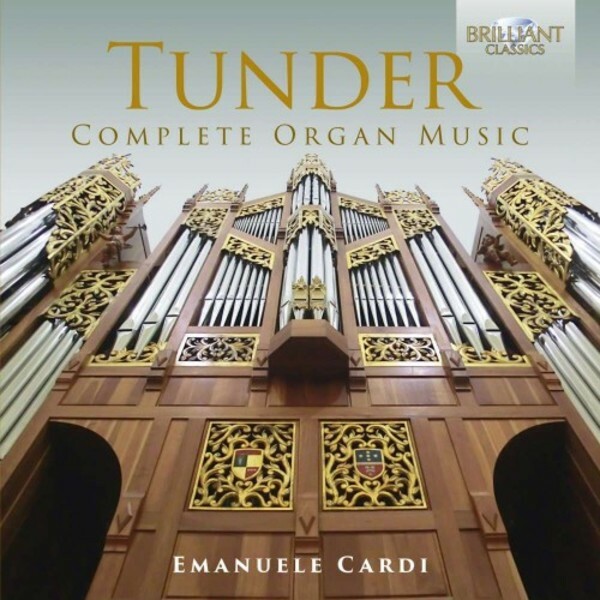 Tunder�s career was made in L�beck, where he became organist of the Marienkirche in 1641, having made a politically expedient marriage to the daughter of the court tailor. Among five children born to the Tunders, Anne Margarethe then married Tunder�s successor in L�beck, the very Dietrich Buxtehude whom Bach hiked halfway up Germany to hear as a young man. In the L�beck Marienkirche Tunder had command of two fine instruments, the large organ (three manuals, 52 stops) and the smaller one in the Totentanz Chapel (three manuals, 40 stops). His music reflects this potential for colour, especially the nine chorale settings: Hauptwerk, R�ckpositiv and pedal are used in varying combinations, including the exchange of voices, interconnections and special echo techniques such as canon‐echo combinations, allowing the application of all its artifices that characterize the stylus phantasticus which is perhaps more associated now with harpsichord and chamber music. These new recordings were made on the organ of the Chiesa di S. Maria della Speranza in Battipaglia (Salerno, Italy), built in 1996 by Glauco Ghilardi, who took as his inspiration the 17th-century North‐German instruments of Arp Schnitger, doyen of organ builders, without whose work the sonority of Bach�s mature writing for the organ is unimaginable.